Upload Product: Uploads all the selected products on sears.com. Delete Product: Deletes the selected products from sears.com. Update Inventory: Updates the inventories of the selected products on sears.com. Deactivate Product: You can deactivate the selected products from sears.com. 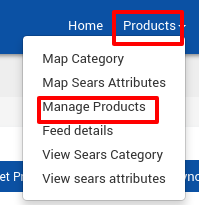 Select the checkboxes associated with the required products. In the select bulk action list, select Upload Products. Note: If there is an error in the product upload, then it appears on the page. Otherwise, a success message appears. Similarly, the store owner can perform the other bulk action on the selected products.